(Nanowerk News) A convenient procedure to visualize defects on graphene layers by mapping the surface of carbon materials with an appropriate contrast agent was introduced by a team of researchers from Zelinsky Institute of Organic Chemistry of Russian Academy of Sciences (Moscow) involved in international collaborative project. Developed imaging (tomography) procedure has revealed organized patterns of defects on large areas of carbon surfaces. Several types of defects on the carbon surface can be "caught" and captured on the microscopic image within a few minutes. The article describing the research was published in Chemical Science journal of Royal Society of Chemistry ("Spatial imaging of carbon reactivity centers in Pd/C catalytic systems"). Graphene and related 2D materials are anticipated to become the compounds of the century. It is not surprising -- graphene is extremely thin and strong, as well as possesses outstanding electrical and thermal characteristics. The impact of material with such unique properties may be really impressive. Scientists foresight the imminent appearance of novel biomedical applications, new generation of smart materials, highly efficient light conversion and photocatalysis reinforced by graphene. However, the stumbling block is that many unique properties and capabilities are related to only perfect graphene with controlled number of defects. However, in reality ideal defect-free graphene surface is difficult to prepare and defects may have various sizes and shapes. In addition, dynamic behaviour and fluctuations make the defects difficult to locate. The process of scanning of large areas of graphene sheets in order to find out defect locations and to estimate the quality of the material is a time-consuming task. Let alone a lack of simple direct methods to capture and visualize defects on the carbon surface. 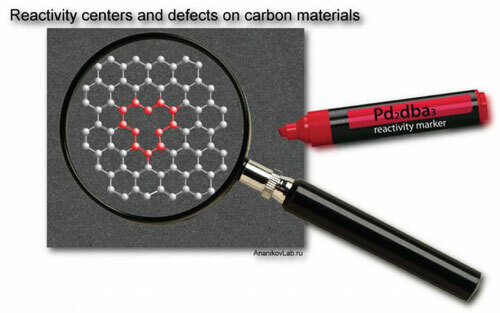 Joint research project carried out by Ananikov and co-workers revealed specific contrast agent -- soluble palladium complex -- that selectively attaches to defect areas on the surface of carbon materials. Pd attachment leads to formation of nanopartilces, which can be easily detected using a routine electron microscope. The more reactive the carbon center is, the stronger is the binding of contrast agent in the imaging procedure. Thus, reactivity centers and defect sites on a carbon surface were mapped in three-dimensional space with high resolution and excellent contrast using a handy nanoscale imaging procedure. The developed procedure distinguished carbon defects not only due to difference in their morphology, but also due to varying chemical reactivity. Therefore, this imaging approach enables the chemical reactivity to be visualized with spatial resolution. Mapping carbon reactivity centers with "Pd markers" gave unique insight into the reactivity of the graphene layers. As revealed in the study, more than 2000 reactive centers can be located per 1 µm2 of the surface area of regular carbon material. The study pointed out the spatial complexity of the carbon material at the nanoscale. Mapping of surface defect density showed substantial gradients and variations across the surface area, which can possess a kind of organized structures of defects. Medical application of imaging (tomography) for diagnostics, including the usage of contrast agents for more accuracy and easier observation, has proven its utility for many years. The present study highlights a new possibility in tomography applications to run diagnostics of materials at atomic scale.